Swiss chef Michael Kloeti matches Vermont’s rustic flavors with European elegance. : Swiss-born chef Michael Kloeti knows a thing or two about European hospitality. Once at the helm of Manhattan’s Lespinasse, he has excelled in bringing his native cuisine to the States. 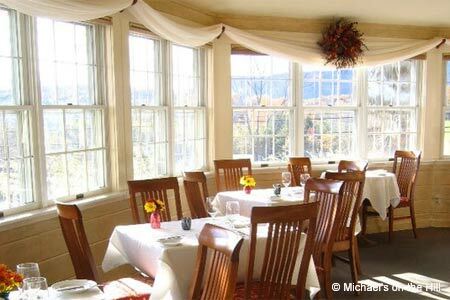 Kloeti’s early 19th-century farmhouse boasts one of Vermont’s elite dining rooms. White linen service sets an elegant tone, but the milieu is relaxed. Guests are greeted warmly, and then treated to tiny potter’s bowls of mixed olives, fresh butter and sea salt. When crusty whole-grain sourdough arrives you’ll want to celebrate. Old-world recipes are reborn at Michael’s, like the spiced carrot soup simmered in smoked coconut and ramp oil. Even unromantic gnocchi is seductive in Kloeti’s sure hands. We recommend the prix-fixe menu, showcasing country favorites such as duck confit. Each tasting begins with an amuse-bouche, but beware: forks will spar over the bite-size bliss of sharp cheddar fritters in harissa aïoli. Don’t miss the seasonal venison loin, expertly roasted to a medium-rare, and then paired with rye knoepfli and choucroute. Savory Swiss dumplings help ground Kloeti’s sour cabbage in a rustic dish that will leave mouths buzzing. It all matches well with a Charles & Charles Cabernet, one of the cellar’s smart buys. Westerly views from the wraparound porch offer mountain sunsets, but you’ll be just as smitten by the Riesling-poached pear on your plate.